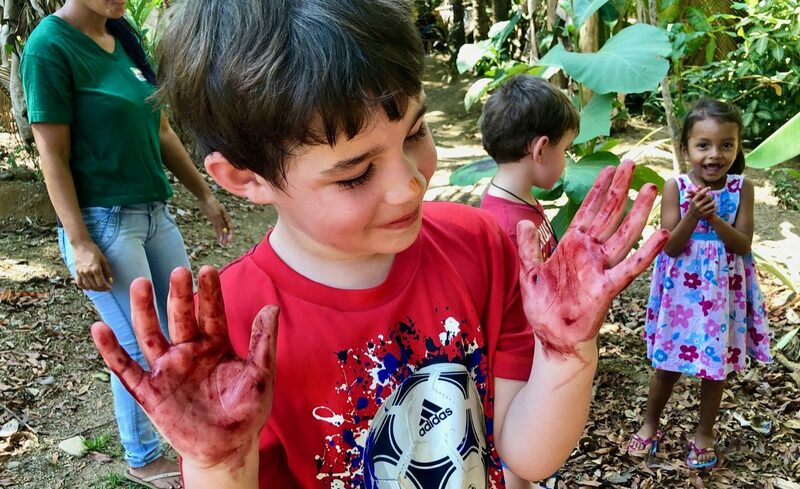 There are so many adrenaline-inducing activities available when visiting Costa Rica that taking a chocolate tour was never at the top of my list. 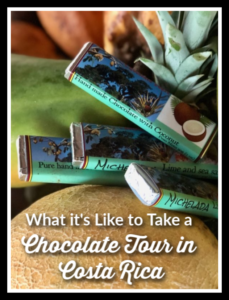 It was actually my fifth trip to this jaw-dropping country before I finally decided to see what all the fuss was about via the “Chocolate and Fruit Tour” at Rancho Raices. I was looking for something I thought the whole family could enjoy, from the three-year-old to Grandma, and who doesn’t love chocolate? As it turned out, visiting this family farm on the Osa Peninsula was one of the highlights of our trip. We came for the chocolate, but learned lots about fruit and medicinal plants on this tour as well. And was he ever! Rancho Raices is a short ten minute drive from Puerto Jimenez. Like many places in Costa Rica, we missed it on our first pass (despite the large sign) and had to flip around and try again; as we did, Don German was opening the gate for us, ushering us in with a big smile. Achiote fruit is the source of annatto, a natural food dye, and also a traditional lipstick and make-up. 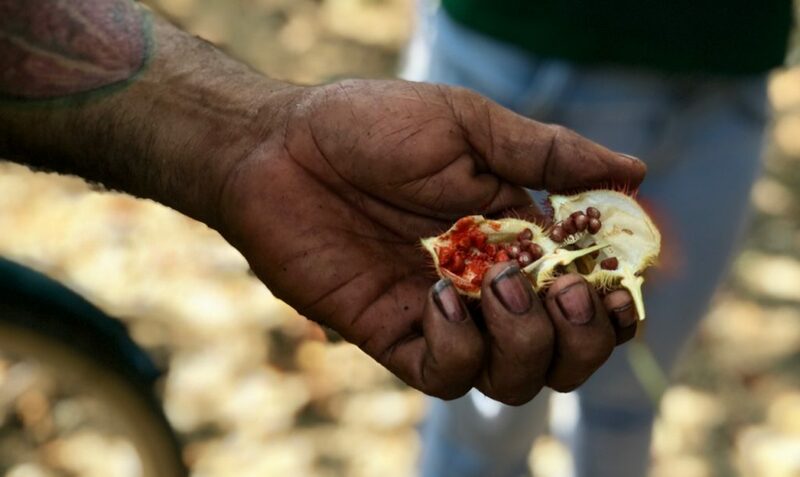 He plucked an achiote fruit, split it open, and used the red-orange wax covering the seeds inside of the spiky fruit to make designs on our skin. Achiote, or the “lipstick tree,” was traditionally used as makeup, and my mom was agreeable enough to apply it despite murmuring that she wasn’t sure it complimented her skin tone. Fun fact: this same waxy red-orange substance from the achiote tree is the source of annatto, which is used in industrial food coloring to add yellow and orange color to things like butter, popcorn, and cheese. As we wound our way along the trail through the forest, Vanessa and Don German showed us more ways in which the earth provides us everything we need. They pointed out the plant that offers a natural insecticide; they cut lengths of young bamboo to make eco-friendly straws from which we drank our coconut water; and they introduced us to one of many medicinal plants, the ficus chilamate, whose milky-white sap is a natural dewormer when given in appropriate limited doses for three weeks. Just when my nine-year-old was starting to complain about the lack of chocolate, we came upon the cacao trees. We were given an excellent education about cacao, inspecting the tree and seeds. The seeds are fermented, then dried in a hot, shaded area of the farm. After they are dried, they are roasted. It is at this stage that we were invited to help in the rest of the process at the rancho, a cool open-air building next to a stream where our tour took a little rest. Vanessa’s three-year-old, Camilla, came skipping by, and immediately made fast friends with my youngest boy despite the language barrier. We were given a chance to sit down in the cool air and greeted with fruit, chocolate milk and even a chocolate fountain! This is truly a family affair and Don German’s wife, son and son-in-law were all present at the rancho. While the three-year-olds chased cats, swung in hammocks and sold each other imaginary hamburgers, we got to work. The roasted cacao beans are first crushed by hand, using a heavy piece of wood, and the shells removed. After this step, they are ground into a thick paste with a hand grinder (my sons’ favorite part, of course). This paste is full of cocoa butter; in processed chocolate, they remove this cocoa butter and add in other fats. At Rancho Raices, however, they leave the chocolate completely pure, adding in just a little sugar. They add in powdered milk to make it milk chocolate, and Vanessa explained they would add in more milk and sugar than usual for the kids. Dark chocolate in its pure form is fairly healthy, unlike the candy we are used to. That also means my kids did not adore it, of course. They did like the milk chocolate, though! 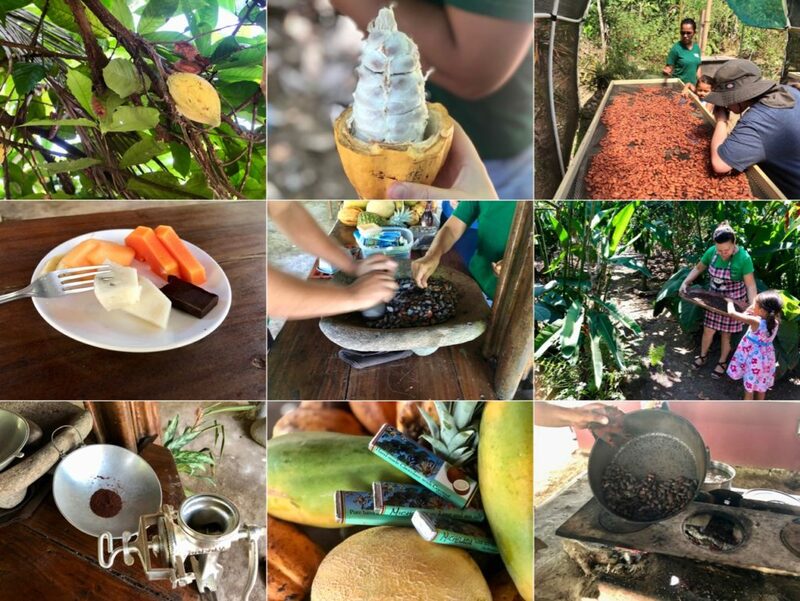 As soon as my kids learned that the inside of the cacao fruit did not taste like the soft-serve ice cream it resembles, they settled in to learn the steps to making chocolate, from seed to bar: drying, roasting, crushing, shelling, grinding, and finally eating! The chocolate paste is then formed into a silicone mold and placed in the fridge to cool so we can eat the very bars we made. While we waited, we were treated by surprise to a chocolate spa. 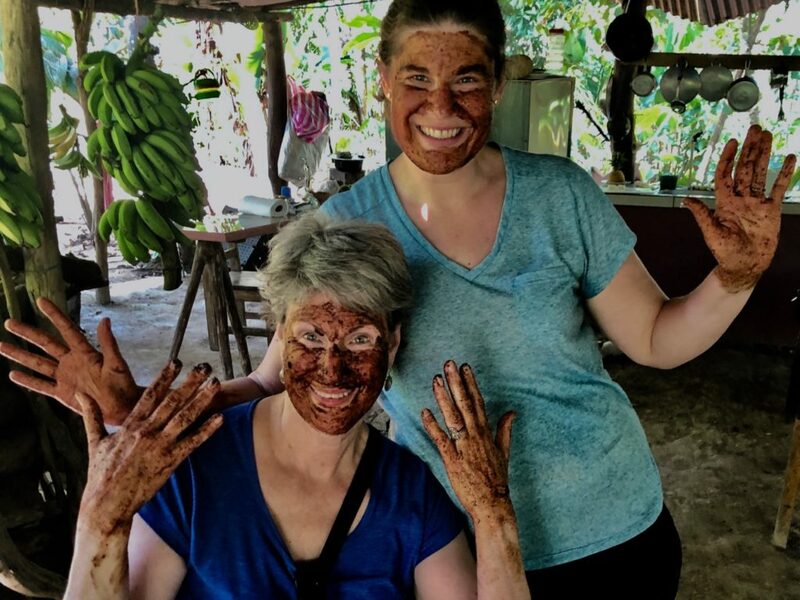 Vanessa explained that the antioxidant properties of cacao are great for skin, and she mixed some of the ground cacao with some coconut oil and applied a mask on my hands and skin. It felt amazing! My age spots aren’t gone yet, but I’m not giving up hope. Just when my kids would start to get antsy, Don German, clearly a doting grandfather accustomed to keeping children entertained, would pull another trick out of a hat — and all his tricks were based on the plants that grow on his beloved land. For example, he asked my boys if they wanted to see magic, then made frighteningly real appearing blood appear out of a handful of dried leaves and some water. And let me tell you, if you want to keep a nine-year-old boy entertained, produce fake blood. At the end, we had chocolate to eat, chocolate bars to take home as gifts, chocolate to make facial scrubs out of, and kids who had been both entertained and educated. We even asked if they had a leaf that would solve our itchy insect bites and Don German’s wife delivered! This lovely, hospitable family provides a tour that is a wonderful introduction to tropical plants but also very entertaining for children. 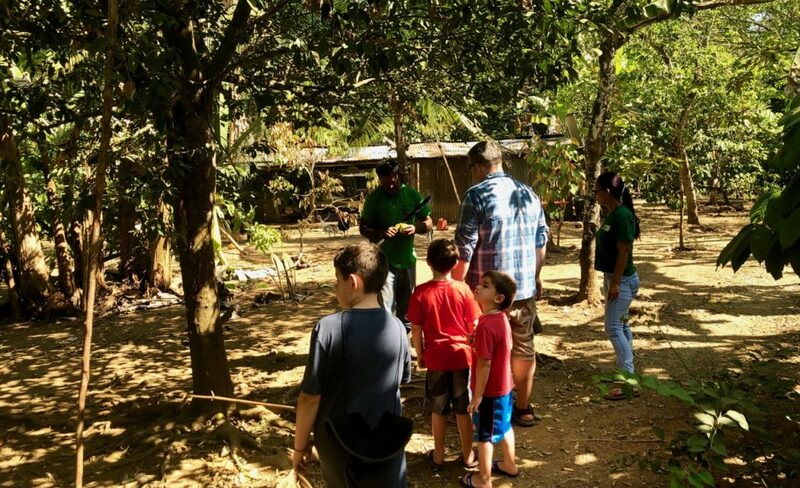 If you’re traveling to the Osa Peninsula with kids, I highly recommend visiting Rancho Raices. To contact Rancho Raices, call 506 8603 0464 in Costa Rica. Any tour agency and most hotels around Puerto Jimenez can book a tour for you at Rancho Raices as well.